According to www.pork.com.au research conducted in 2009 into the benefits of lean, trimmed pork has found that, if you have type 2 diabetes and are overweight or obese, then regular lean pork intake may be beneficial. Specifically a high protein, lower carbohydrate diet that includes regular lean pork intake in conjunction with resistance exercise will give you excellent weight and fat loss results. The most recent research that preceded this was the Pork Nutrition Survey which found that lean, trimmed pork is as lean as skinless chicken breast - and has half the fat of red meat. The survey also named pork as a low fat, high protein dietary source. The report - which based its research on actual pork cuts purchased in retail stores across Australia to accurately reflect the pork that 'real' consumers purchase everyday - concluded that pork is lean and nutrient dense. It contains essential vitamins such as B12, B6, thiamin, niacin, and minerals such as zinc, selenium, iron and magnesium. In everyday language, this means that lean pork is beneficial for growth and maintaining nerves, cardiovascular function and muscle strength. 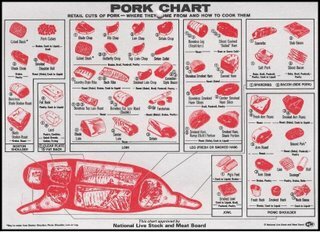 Lean trimmed pork has something for everyone. Some religions prohibit the flesh of pig from being eaten - notably Jewish Law and Islamic Law. If you are interested in reading more about this, see this article which addresses this topic. For those of us not bound by religious restriction, Pork is considered delicious, a delicacy. 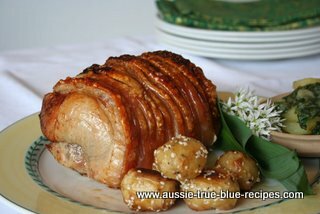 A typical Australian Christmas is celebrated with Roast Pork and Honey Glazed Ham - usually served cold due to Christmas occurring during the hottest part of the year.